CHW was originally owned and maintained by the Pennsylvania Railroad (PRR) and as such accessed Center City via the PRR's right-of-way, nowadays the Northeast Corridor, via Zoo Interlocking and 30th St. into Broad St. Station, nowadays Suburban Station. This routing is highly circuitous and adds a good ten minutes to the line's schedule. It also involves a flat junction across the NEC, such that its outbound trains foul the entire Corridor; this has the side effect of inhibiting its schedule frequency. Clearly, a reconsideration of the Swampoodle Connection is needed in order to optimize existing services. Phase 1. The dark blue represents the Reading lines, light blue the PRR. Orange is the first junction. 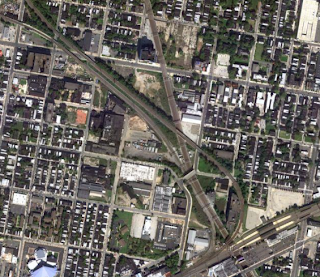 Doing this is relatively simple: a flat junction between the two lines where they are more-or-less level with each other just south of Allegheny station. 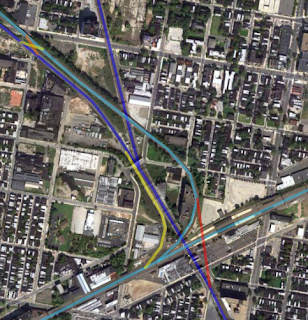 This moves the primary flat junction to the easier-to-dispatch SEPTA Main, as seen above. But this is not the only use of a Swampoodle connection; rather, it is the beginning of a complex. Phase 2. The yellow line represents the extensions. The next step would be inaugurated by the, well, inauguration of diesel commuter rail from Norristown to Pottstown (or even Reading). While the traditional Schuylkill Valley Metro project is deader than the dinosaurs, there is no reason a basic diesel push-pull service would not do well. After all, that was how the Reading (and later SEPTA) ran the line for many years! 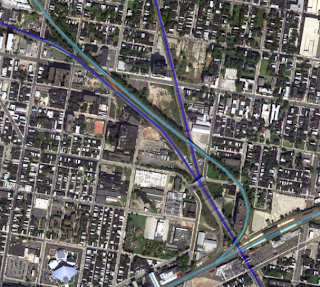 Such a quick-and-dirty restart would necessarily terminate in 30th St. Station's lower level, but utilize the former Reading main line, and hence would necessitate a second connection at Swampoodle, this time going the other way--from the R6 to the NEC. Phase 2 accomplishes this by using the former interchange track as well as the original R8 flyover; the Phase 1 junction becomes a full crossover. The problem with this is, of course, that it would (again) create a fouling situation on the NEC, on top of being (again) an extremely circuitous entré into Center City from the north. On top of this, restarting commuter rail along the Reading main is an excellent skeletal framework for reconsidering the (underutilized) Stoney Creek Branch as a route into the city from the North Penn area, as well as the (currently a trail) former Perkiomen Branch, which would offer improved access to towns up the Perkiomen Creek Valley, most notably Collegeville-Trappe, Graterford, Schwenksville, and the Pennsburg-Green Lane-Red Hill area. Passenger service along the Reading main also offers the promise of electrification--to Phoenixville, in particular, shows promise--and possibly eventually Pottstown. Phase 3: the red line superimposed on the previous works. While the majority of the issues, longer-term, would be solved by reactivating the Pencoyd Viaduct (more on that later) and converting the former PRR Schuylkill Branch, the remnant of which is the Cynwyd Line (R6), into a cutoff linking the Reading and PRR main lines and offering a much more direct entry into Center City from the northwest, locals to Norristown (Phoenixville?) and CHW will still be wanting to use Swampoodle. Phase 3 thus seeks to eliminate the flat junction between the SEPTA main and the Norristown Line, utilizing the former CHW alignment and the infrastructure of the previous two phases' interlocking. Phase 3, the most expensive addition to the Swampoodle complex, would involve cutting a shallow trench tunnel from the CHW's North Philadelphia station under the Trenton Line's and through a Pathmark parking lot into the SEPTA main line. This would convert the basic interlocking achieved in Phase 1 into a fully high-speed junction. If management wishes, a shallow tunnel can also be cut under the NEC in order to grade-separate the northbound junction at this phase (especially if Swampoodle can be achieved before Pencoyd), in order to offer full operational flexibility--even though the Norristown Line-to-NEC side of Swampoodle would have significantly less usage than the SEPTA-Main-to-Norristown-and-CHW-Lines side. 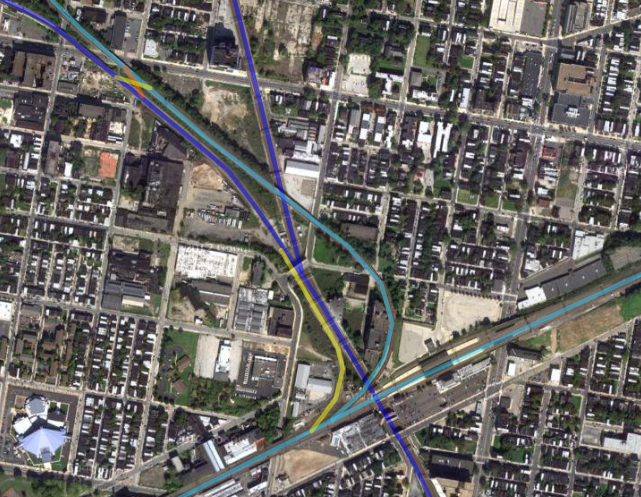 Once Pencoyd is up and running, the Norristown-to-NEC side will be more a secondary path to be used mainly if the primary Pencoyd path has to be closed for any reason. Swampoodle, like Pencoyd, is a potential interlocking with regionally-important implications. This post is intended to be a laying-out of a program to develop it to its full potential. How Much, Really, Can You Squeeze In? This post is inspired by a quote from a Mayor's Office of Transportation and Utilities (MOTU) spokesperson in an interview from Plan Philly having to do with the 10th Street Chinatown bike lane: that the technical maximum per traffic lane is 800 vehicles/hour. Now, I'll agree that there's a technical maximum. I am not so sure that it is so blasély quantifiable. Think about it: the movement of a car has two geometrical elements that must pass any point or line before the next can take its place in safe progression--the carbody itself, as well as the reaction space in front of the car. This unoccupied reaction space grows proportionally to the speed of travel--it decreases the total number of vehicles which can safely progress through a point the faster these vehicles are going. Another way of saying this is that per-lane traffic progression (throughput) is a function of the reaction space of the car, itself a function of the speed of the car. As mean speed goes up, throughput (how many cars can actually progress through a given point) goes down, and vice versa, until stop is achieved and the system is clogged. Ironically enough, peak throughput occurs when the system is so congested as to inhibit unimpeded movement, but no so congested as to actually be clogged--that is to say, a rush hour traffic jam. Peak throughput occurs in speeds that utterly fail to capitalize on the car's major advantages (i.e. its speed premium) and so autocentric traffic systems are designed in such a way as to avoid peak throughput. This, in its turn, incurs further costs (transportation mode restriction, increased spatial consumption = sprawl, etc.). Let us assume mean speed on the stretch of 10th St. in question is 10 mph. It's in Chinatown, which lots of stoplights, jaywalkers, and cars coming from the north or off the Vine Street Expwy., so this is a reasonable assumption. Given the throughput model I've just outlined here, how many cars can pass per hour in a single driving lane? Since 1 mile = 5280 ft., 10 miles = 52,800 ft. Therefore a vehicle traveling 10 mph traverses 52,800 feet in an hour. The PA Driver's Manual recommends keeping 6 seconds' stopping distance, and a rule of thumb is that the stopping distance is roughly 1 carlength per 10 mph. 6 seconds' stopping distance is 52,800/60 = 800 feet/min, 800/60 = 13.3 ft/sec, 13.3*6 = 80 ft. stopping distance. Obviously not a tenable figure for any reasonable calculation*. So let us use the rule of thumb then. Picture a row of cars lined up, bumper-to-bumper, exactly a mile long. Since the rule of thumb is that a car's stopping distance is itself every 10 mph, we can divide to obtain the number we're looking for. For this purpose, let us say the average car is 18 ft. SUVs and light trucks are 20 ft. (or longer), while coupes are around 15 ft. This means there are 294 cars to the mile. Divide by half and we see that 147 cars can traverse 1 mile at 10 mph; multiply this by 10 and the number is 1,470 cars/hr (quite a bit more than 800 cars/hr)**. Having tried these two calculations, one significantly lower than the MOTU number, and the other significantly higher--but the MOTU number floating serenely almost at the exact median between the two--we're forced to wonder: how did they come up with this number in the first place? * But if you must know, this works out to an average geometric car being 98 feet long! It would take 7.37 seconds for this body to traverse that distance at that speed, which works out to 488.47 of those things in an hour--which is significantly lower than the MOTU number^. ^ Let's take this model further. 5280 ft/mile = 316,800 ft traversed at 60 mph. 316,800/3600 = 88 feet traversed per second. 88(6) = 528 ft reaction space + 18 ft (car) = 546 ft. geometrical object. 316,800/546 = 580.22 vehicles/hr at 60 mph^^^. ** According to this model, a car traveling at 20 mph is 3 vehicle units, at 30, 4, at 40, 5, and so on^^. So you can amortize to the hour to figure out traversal per point in an hour^^^. ^^ The model can be described as x = (C/y)z, where x is maximal cars/lane/mile in unimpeded conditions, C is carlengths per mile (a unit of length), y is geometric carlengths needed for free-flowing conditions per x10 mph, and z is mph. ^^^ But this contradicts the hypothesis I described earlier in the post. Throughput at 60 mph would be (297/7)60 = 2520 cars/lane/hr, which is noticeably higher than 10 mph throughput of 1470 cars/lane/hour. What do we make of this? A solution may be that the numbers we're using all describe free-flowing (unimpeded) conditions, whereas congestion is congested (impeded) conditions. Last fall, Steven Smith noted that European mass transit is subsidized the same amount as its American counterpart. Yet Europe has extensive mass transit offerings just about everywhere, to the point where it is difficult to find anyplace that has mediocre access relative to density or none at all, whereas in the U.S. the picture is the obverse. What gives? Most complaints fall against ill-structured subsidization packages: roads in the U.S. have substantially higher subsidies relative to their European counterparts; driving standards here are rather more lax; exclusionary land use promotes driver culture at the expense of transit culture; etc. Part of this is of course true. Road standards are excessive and promote speeding which in turn promotes lax enforcement; land use is not planned in a way to support transit nodes; and road subsidies are hidden while transit subsidies are often paraded front and center. DOTs want to do nothing but build roads, and politicians insist on micromanaging transit while at the same time ignoring the multitude of excessive standards (and entailed ballooned costs) in the road planning arena. It's as if they have a monocle on one eye and a log in the other. But that isn't the key problem. Smith, in his article, points out that the Bay Area receives an equivalent amount of transit funding for an equivalent population as Switzerland--but Switzerland has incontestably excellent transit while the Bay Area's, while good by U.S. standards, is, ahem, lacking. As Elizabeth Alexis notes, in Smith's quote, "The problem is more of how we spend money, not the amount of money." And you wonder where all the money goes! That's not the worst of it, though. American transit agencies are incredibly territorial, and jealously guard their turf to the point of undermining the common need for improved transit access. How else can you defend Millbrae, which seems to have been spitefully designed to inhibit Bay Area high-speed travel via the Caltrain ROW as expensively as possible? Or spending money to reduce interlocking redundancy, which in its turn undercuts on-time performance? Elizabeth Alexis is dead right. And in the U.S., we spend money on bloated redundant bureaucracy, on entrenching petty squabbles in concrete, and at the end of the day we find we have no money to actually run transit, let alone well. Organization before electronics before concrete, the Germans say. But here we take concrete uber alles, and even use concrete to entrench organizational inefficiencies.